Logitech H820e Wireless Mono Dual Headset, Retail Box , 1 year Limit warranty. During long conference calls, getting up out of your chair can make all the difference. Wearing the Logitech H820e Wireless Headset frees you to take notes on a whiteboard, step into a quiet office, or stand up and stretch. Designed for comfort as well as convenience, H820e includes a padded headband and soft, replaceable ear pads, with noise-cancelling technology.Located on the backside of the boom, an LED indicator provides a visual alert to those behind you that you are on a call, preventing accidental disturbances during calls.With acoustic echo cancellation and a noise-cancelling microphone, H820e is optimized so you can hear and be heard, even in noisy workspaces. 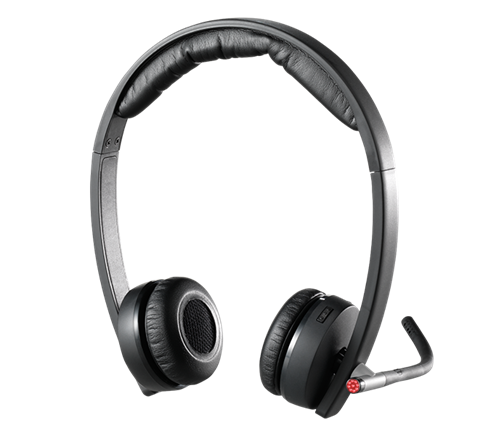 H820e headsets automatically pair when placed in any H820e charger dock, making it easy to use the headsets with any workstation in large deployment or hot desking situations. Control the call with on-ear answer/end1 and volume up/ down buttons. The raised button design provides a point of reference for your fingers so you can feel the buttons you’re pressing. Mute and unmute with a tactile button on the adjustable boom. Logitech Sound Protection protects against sounds above 115 dBA to deliver exceptional listening comfort for voice and music; compliant with EN60950-1. DECT spectrum wireless connectivity provides exceptional wireless range that won’t interfere with Wi-Fi® devices in your office. An option to switch between wide and narrow band improves performance in areas of high-density deployment and extends talk time.